Every Holiday season I look forward to setting up our hot drink bar. 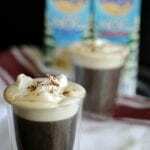 I have hot cocoa, cider and coffee ready to go; plus toppings to make that drink an extra bit special. It makes creating a warm drink easier, fun and it’s perfect for when we have guests over, because they can help themselves. 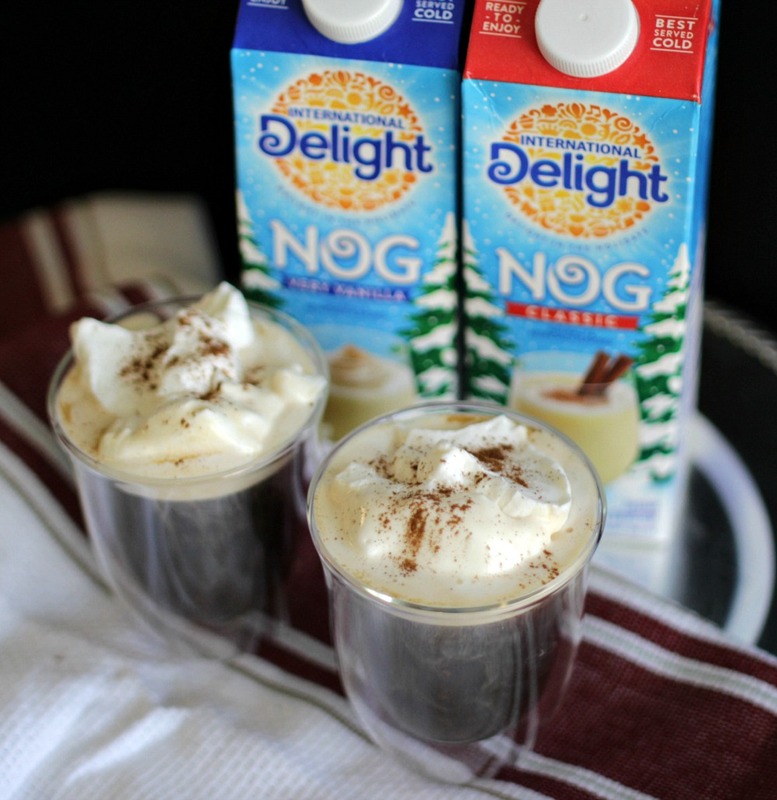 When I heard about International Delight’s Original Nog and Vanilla Nog, I knew there was going to be homemade egg nog whipped cream in our future. It’s the perfect topping for a hot cup of coffee, cocoa or to even top off a slice of pie. 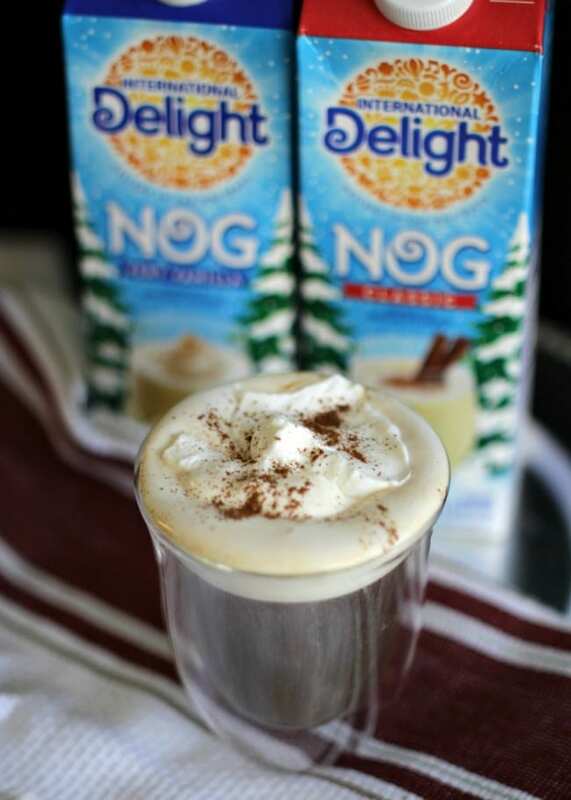 With one creamy dollop of egg nog whipped cream, a cup of coffee turned into an instant egg nog latte. I knew it was going to taste good, but I had no idea just how good. Plus, it only takes 3 ingredients to whip this up! Take a chilled bowl (stainless steel works best) and pour 1 1/2 cups of heavy whipping cream in the bowl. Beat on low for one minute. Turn mixer up to high and add 1/4 cup of sugar and beat for another minute. Add 5 Tablespoons of International Original Nog or Vanilla Nog and beat until soft peaks form. 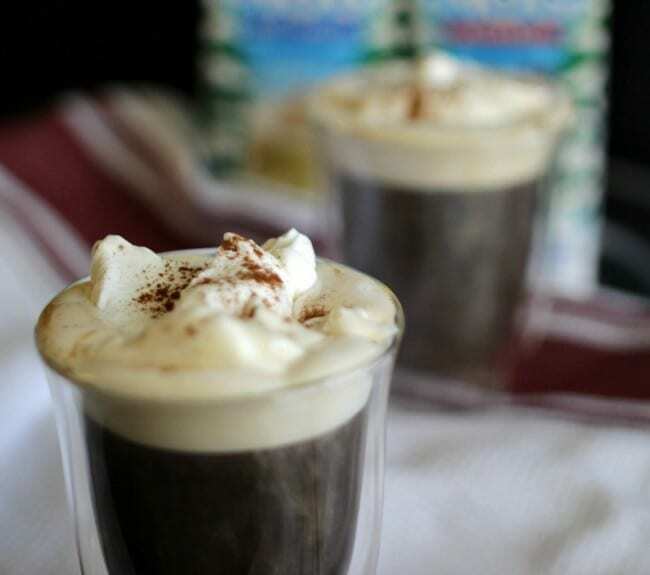 Add a dollop to your cup of hot coffee and sprinkle a bit of cinnamon or nutmeg on top. Sip and enjoy. I was really excited to hear that International Delight added hot chocolate to their line up of products this year. You just pour, heat and serve. Both their New! 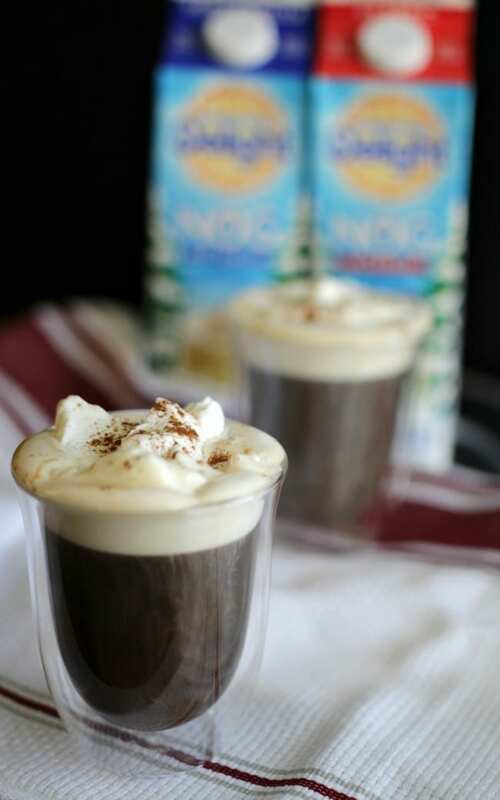 Hot Chocolate and Nogs can be found at Kroger, Ahold, Meijer, Harris TeeterWakefern, Delhaize, HEB and Bi-Lo. You can use the store locator to find product near you. What brings spirit to your Holidays? Is it a handed down recipe you make every year, a special drink you look forward to indulging in or a person you only get to see once a year? Visit InternationalDelight.com and share your holiday spirit for a chance to win a $5,000 Holiday brunch for friends and family, hosted by International Delight! Can you imagine? That would be so much fun. A rich, creamy egg nog whipped cream recipe to serve with your hot drinks or desserts this holiday season. 1. Pour the whipping cream into a chilled bowl and beat on low for 1 minute. 2. While beating, slowly add the sugar and beat on high for another minute. 3. Add the nog and beat on high until soft peaks form. Have you made or tried homemade egg nog whipped cream? Trust me when I say you’ll want to put it on just about everything. Next articleHow Would You Like to Win a Kitchenaid Mixer? This makes me want to dive face first into that amazing whip!!! What a perfect holiday drink!! WOAH. This is the best idea EVER!!! I need to try this for this holidays! Oh yummy! Sounds like such a great a great treat for drinks! Heading to the store now. This is WAY too yummy to pass up!! !